The U.S. 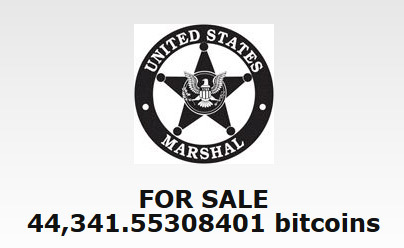 Marshals are auctioning approximately 44341 Bitcoins, the last remaining Bitcoins in its custody in connection with the criminal conviction of and civil forfeiture action against Ross Ulbricht and Silk Road. The auction will take place during a six-hour period Nov. 5 from 8 a.m. to 2 p.m. EST. Bids will be accepted by email from pre-registered bidders only. The bitcoins are being offered in 22 blocks: 21 blocks of 2,000 bitcoins and 1 block of just over 2,341 bitcoins. The winning bidder(s) will be notified Nov. 6. The registration period starts Oct. 19 and runs until noon Nov. 2, at which time potential bidders must have completed all registration requirements. Registration documents that were submitted for the Marshals’ previous bitcoin auctions are not valid for this auction; interested bidders must submit new registration documents to be considered for this auction. The USMS has announced that they are going to be holding another auction for 50000 more Bitcoins from the BTC seized as a part of the Silk Road bust. The auction will be held on March 5th, but the bidders that are interested to participate in the BTC auction need to register not later than March 2nd. This will be the third and most likely not the last auction that the US Marshals Service will for confiscated Bitcoins associated with the Silk Road case now that Ross Ulbricht has been found guilty as the operator of the Silk Road black market. It will be interesting to see what will be the interest this time and to see what will be the price of the winning big now that the Bitcoin exchange rate is not that high, especially compared to the first auction where the price per BTC was probably in the 700 USD range. The U.S. Marshals Service (USMS) has announced that they will be holding another auction for 50000 more Bitcoins that have being seized from Ross Ulbricht accused of being the Silk Road black market operator. This is the second auction of confiscated Bitcoins from Silk ROad after earlier this year USMS held an auction for about 30000 BTC. Last time the news about the auction have caused a sudden drop in the Bitcoin price and we are probably also going to see similar situation this time. However this time things will probably remain calmer, especially considering the fact that the price of Bitcoin is currently lower and people should not be so worried like the first time. Interested parties must register for the auction between November 17th and December 1st and the auction itself will take place on December 4th with the winner of the auction to be announces by USMS on December 5, by 5:00pm EST. It will be interesting to see if Tim Draper who won the previous auction for all of the coins offered will be participating this time as well and if he will be ne winner again with the highest bid.